On my last night in Vegas, I finally ventured out of the Venetian and stolled with a colleague to the nearby Bellagio with it's dancing water fountains. 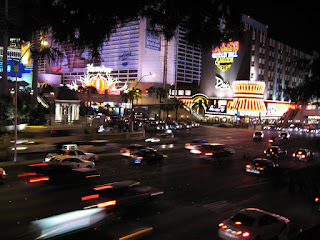 The weather was very pleasant and it was fun leisurely walking through the neon-lit Strip's sidewalks. After reaching the Bellagio, we headed straight to Fix for a drink. While at Fix they also serve contemporary All-American fare, we were content to sit at the bar with our drinks and talk. Constructed almost entirely of Costa Rican Padouk wood, this restaurant has been designed by Graft of Berlin to create a vibrant environment with an unique design. As the evening set in, the bar and lounge becane quickly full and lively. There were the obviously newly-weds lost in themselves, the animated groups of friends out for a party, pretty waitressses who looked in danger of spilling out of their little black dresses, and the tireless bartenders who expertly turned out drinks by the dozen. After an hour and a few drinks later, we walked back to our hotel. We decided to go up to Wolfgang Puck's cafe, Postrio for a light dinner before retiring to our rooms. They have a wonderful selection in the Small Plates section. 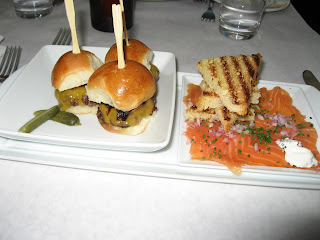 I chose the Kobe beef sliders with Tillamook cheddar and applewood smoked bacon, and the house-smoked salmon with dill creme fraiche and grilled brioche. The sliders are mini-cheeseburgers that melted in the mouth. The salmon too was wonderful to nibble along with the flaky brioche bread. Next day, I woke up late and missed my breakfast. 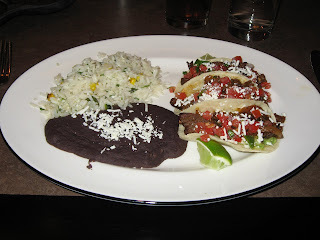 However, since restaurants open early (as compared to India), I was able to walk into Dos Caminos for lunch at 11AM. Like in New York, Dos Caminos in Las Vegas offers contemporary, and inventive Mexican fare along with a vibrant bar scene. Building on classic Mexican staples of guacamole, empanadas and tacos, the menu includes signature items created exclusively for Las Vegas from Executive Chef Scott Linquist. They also offer an interesting breakfast menu along with an extensive tequila selection. 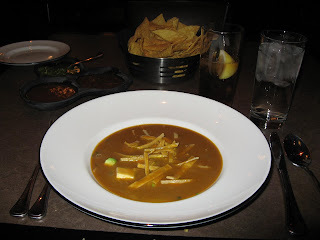 The tortilla Soup of grilled chicken, tomato and red chile broth, queso fresco, and avocado was extra-ordinary. Thick and tasted of lentils/chick-peas. My Asada Tacos were made of grilled Kobe beef, carmalized onions, cotija cheese, guacamole. Like the waitress said, it doesn't get any better than this! For dessert I chose the Mexican flan, made of tequila-chocolate and berry salsita. 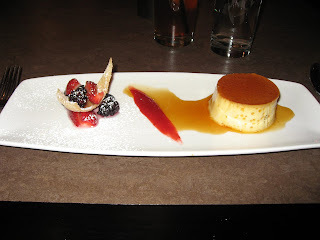 The flan was very smooth, thick and appealing both to the eye and the palate. Both food and ambiance in this restaurant are great! I thought the interior decor and lighting was very creative, especially in the large bar and lounge area. If you are in the Venetian-Palazzo complex, do try this place once! It was finally time to check-out and drive down to the airport. I had an evening flight to San Francisco where I will get some rest during the weekend before another hectic, meeting-filled week begins in the Bay Area. Now you are off to SF? I am sure another foodie adventure awaits you there! @indicaspecies: Thank you! Yes I did.